“My name is Claude and I have the pleasure to serve as the coordinator of this circle. 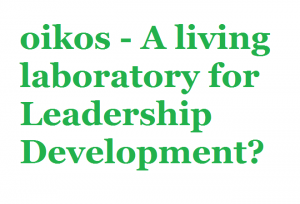 Being, sort of, a dinosaur with some 25 years of oikos experience in my backpack, I am absolutely convinced that oikos chapters are living laboratories for leadership development. Yet, at least during my time as the president of oikos St.Gallen, I did not unleash the learning opportunities flowing from our many projects, roles and diverse community. – How do we develop ourselves while we develop our chapters? – What are great practices to be shared and where do we locate levers for learning? Not satisfied with the leadership education your school is offering?